A few of you have asked about our past events and if we were still doing them. 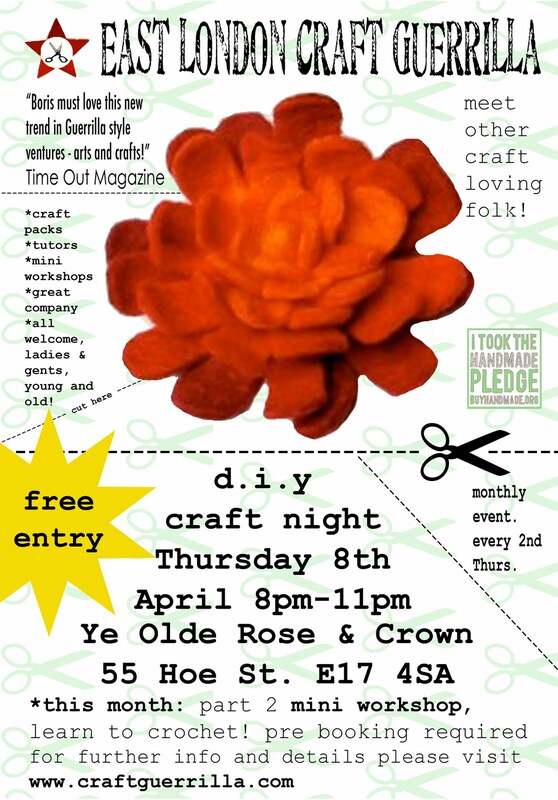 Well at the moment because we're running on a slimmed down crew we're only hosting our monthly DIY craft nights in Ye Olde Rose & Crown in Walthamstow and the monthly craft markets which start in May also in Walthamstow. We know and we hear that you'd like us to re do them but at the moment ...it's just not possible. Once all the Craft Guerrilla gals are back and happy to take up their events then we're sure to take a few back on again. See you soon my craft loving mateys! Spring is a busy time for us. We love getting our craft closet sorted...sort out tools, spring clean all those materials and brush up on some skills! As well as come up with a few nifty ideas for mini workshops we're always on the look out for new tutors. If you can teach a craft discipline and can create a fun and inexpensive project for a mini work shop then contact us. We'd love to hear your ideas! 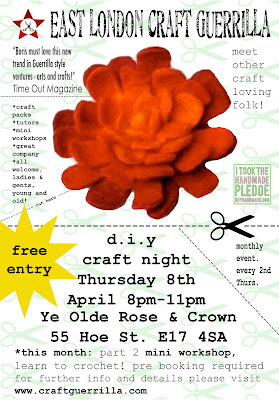 Spring DIY craft night Thursday 8th April 8pm - 11pm Ye Olde Rose & Crown 55 Hoe Street E17. *Small fee per work shop. Pre booking required. We get contacted a lot to help advertise and to find designer makers for several charity events. This one has been going for quite a while now and we think it's pretty good! So if you fancy selling your hand made wares please read on. This event is independently run for a charitable cause and not by us so if you need more info please ask the organizer Liz Mason. "We aim for our advertising/programme to include stall holders and sponsors details and stall holders are welcome to hand out their own advertising material. Please pass on my details to your members who are welcome to contact me with questions." sneaky peek at what's to come... Queenie & Ted! Queenie & Ted is all about making a mark,dedicated to creating unique customised clothing and accessories. 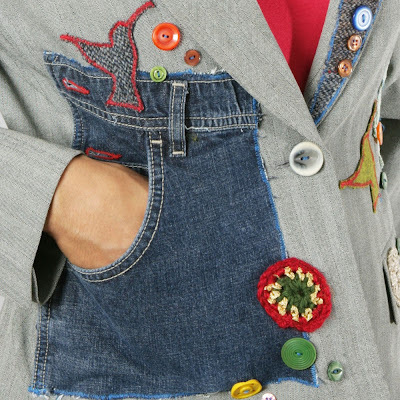 Nearly new jackets are upcycled using contemporary appliqué, embroidery, buttons and sumptuous trimmings. The discarded become beautiful things to be treasured once more. 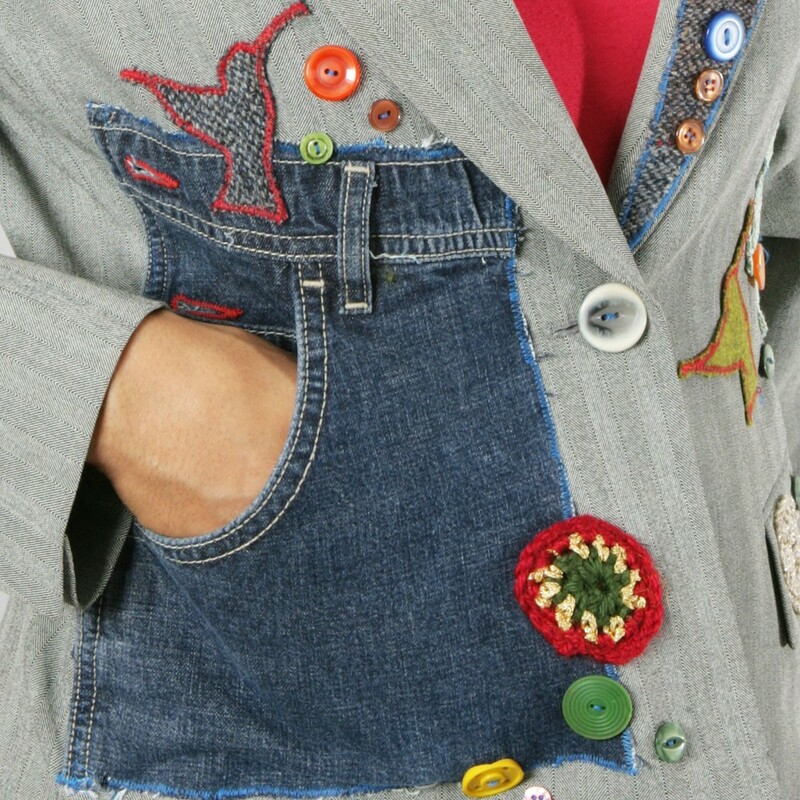 Our clothing is appliqued with old jeans, blankets and tea towels and then embellished with textiles that evoke memories of Granny’s airing cupboard. 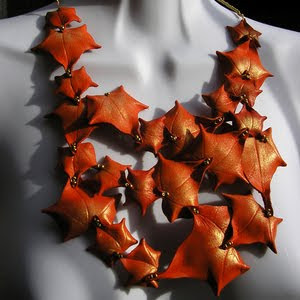 They are wearable art and the hand of the maker is always evident. 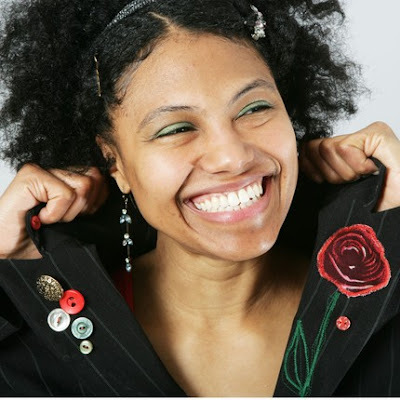 Being obsessive makers is central to our identities and what is made does not sit quietly. Here are the two lovelies which took over the Brighton Craft Guerrilla...Sam and Emma! They're the two gorgeous craft lovin'ladies that took over from Angela Chick and friends. We were sad to see Angela go but we know she's on to a very successful venture and we wish her all the luck. BUT I'm pleased to say that by the power of TWITTER we found each other and now there really is no stopping these gals. Check out their blog for news, tutorials, updates and keep those peepers peeled for their events which kick off soon...I hear they're stitching to get going. Welcome to the army ladies! sneaky peek at what's to come... WEAR-ME! With May comes the promise of summer and the first of our SUMMER CRAFT MARKETS. Nestled in the lovely Village quarter of Walthamstow our perfectly charming garden craft market showcases the work of many a talented designer maker. Apart from the firm favourites this year we have lots of new designers from recycled fashion, illustration, accessories, millinery, paper goods, home accessories, candles, home baked cakes and lots more. We're truly bursting at the seems with great, original and "every so moreish" craft! 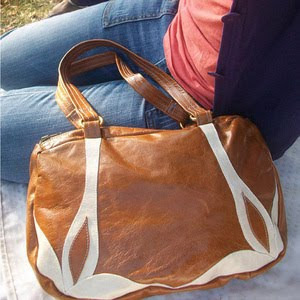 We'll be showcasing designer makers starting off with the lovelies that will be at our May date. Tic Tac Toe...free stalls up for grabs in Whitechapel! "We will be starting a once a month event in London. The event is called 'Tik Tac Toe' and will be a whole day into evening thing with an acoustic band in the afternoon along with market stalls, cakes, tea, food, board games etc and then a headline act in the evening along with happy hour, and Djs. We’ll need market stalls- selling all manner of arts and craft things- set up for a small portion of the day, between 2pm-6pm. There will be no set up fee’s for sellers." Can't quite believe that it's almost that time of year again. Spring is definitely in the air and the anticipation is electric. I really can't wait for our first craft market in May!!! This year we're doing things a little bit different regarding bookings. Because of the high number of requests we're keeping things simple: New vendors will be offered one date and the dates for regular designer makers will be capped to 2 per season and any remaining spaces will be offered on a waiting list basis. This is simply because we'll be on our third season and we'd like to keep things fresh IE offer shoppers new items by a selection of designer makers! Because stall numbers are limited we'd like to get a nice mix of great craft.Our markets are quickly becoming the monthly event to come to in Walthamstow.I guess the quality and variety of affordable original craft is something people really appreciate. AND it's still free to get in. The markets are very well subscribed and visitor numbers have steadily increased through out the time we've been hosting the markets in the shop garden. We will send a mail out on the 22nd of March, please have your dates ready when you book and a 2nd,3rd and 4th preference in case the requested date is full. Pricing your stock getting you in a spin? Stuck with pricing your work? Not quite sure if it's too expensive, too cheap? ETC. ETC. ETC. The endless questions new makers ask are mainly about how to get this sticky little issue right! We love the fact that lots of you are coming to our diy craft nights and using the skills to start selling work but we need to make it quite clear that what we don't like is crafters that undersell their work therefore making everyone else's seem that bit much more expensive.It's unfair to those who are trying to make a living out of craft and we hope you'll find this helpful...we're not trying to be patronizing or tell you what to do but the reason why we're posting this issue is because quite a few people have asked us for advice and I'm pretty sure if you look at the design sponge blog that you'll have the majority of your questions answered. Knitting & Stitching Show Deadline Extenstion! We have decided to extend the deadline for submissions for our opportunity for a stand at the Knitting and Stitching Shows to allow more time for entries. We are particularly keen to hear from people who want to exhibit at the Harrogate and Dublin shows! Spread the word amongst your crafty friends and family that they now have until midday on Sunday 28th March to send us their submissions. We are still aiming to have our decisions made by 31st March as to who has made it through to the second round when we will be conducting interviews (by email and/or telephone) and requests for samples.